It’s been almost a year exactly, since my last notecard swap. Too long, don’t you think? Anyone want to play? Here is what you need to do…. 1) Theme: Birds, bees, flowers, trees ~ interpret however you like. 2) Decorate 5 notecards (include envelopes) using any medium you would like (fabric, paper, paint, pencil, photos, stamps, images of your art, etc). Cards (& postage) need to be sent to me no later than March 31st. 3) Detailed instructions will be sent to you via email once sign-up has closed. 4) To sign up, email me at: regina AT creativekismet DOT com. Send your name, address and blog url (if you have one). Sign-up will close March 16th. 5) Please join the fun and get the word out! Use the above image if you like. I will have a button on my sidebar soon. Check out the flickr group for inspiration. Check out this other great swap! Michelle over at Greetingarts is having her 2nd embroidery button swap. 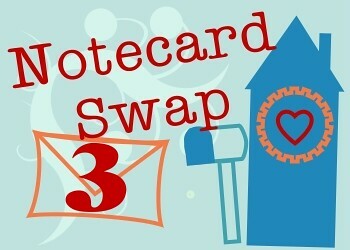 I know you can handle two swaps at once, so hop on over and sign up for hers too! The more the merrier! This entry was posted on Thursday, March 8th, 2007 at 11:38 pm	and is filed under Swaps. You can follow any responses to this entry through the RSS 2.0 feed. You can leave a response, or trackback from your own site. Edit this entry. This entry was posted in Mail box. Bookmark the permalink. 9 Responses to Let’s Swap!! A notecard swap – what fun – I’m signing up. Thanks Regina! Ok you twisted my arm–I need more things to distract me from homework! Hi Regina, I emailed you yesterday about this swap but wasn’t sure if you got it! I’d definitely love to be part of this! REgina!! im in for sure – you know i love your notecard swaps!! I just might have to join this. Sounds like fun–count me in.